THE first years of Sir Philip Nash's chairmanship had been a period of rapid development, both mental and material. The Company had attained full independence and had gained a worldwide reputation alike for the quality of its products, the calibre of its personnel, and the breadth of its experience. It was now to become a leading member of a grand alliance. Intense competition from continental manufacturers had cast a shadow over business for many years, and there came a time when only drastic price reductions could enable the Company to maintain its position in foreign markets. But this in the long run would inevitably eat into the resources available for developing markets and products: for a single concern the position would become untenable, As long as individual firms continued to parallel each other's activities and developments there would be ever-growing expenditure in competition, and an unsatisfactory situation would continue. On the other hand, cooperation within the industry would eliminate unnecessary duplication of effort and expenditure and effect the necessary economies in research, engineering developments, manufacturing processes, and materials. Then would come the answer long sought for— lower selling prices and larger turnover. It was in pursuit of this policy that in 1927 the control of M-V, which had recently passed from Vickers to the International General Electric Company, was acquired by F. Dudley Docker. Once more Docker was a deciding factor in the affairs of a great electrical concern, and now he could promote his plans for rationalization; his ultimate aim was to establish a British electrical engineering corporation resting on sound foundations and organized to compete on equal terms with similar undertakings abroad. By the spring of 1928 negotiations were in train with the British Thomson-Houston Company, the Edison Swan Electric Co and Ferguson, Pailin Limited. In the last months of the year they were successfully concluded, and the decisive steps taken to effect a scheme of consolidation. For convenience the Metropolitan-Vickers business was transferred to an existing subsidiary, and the old Company renamed was used as a holding company for the group. Thus Associated Electrical Industries Limited employing 30,000 people came into being. 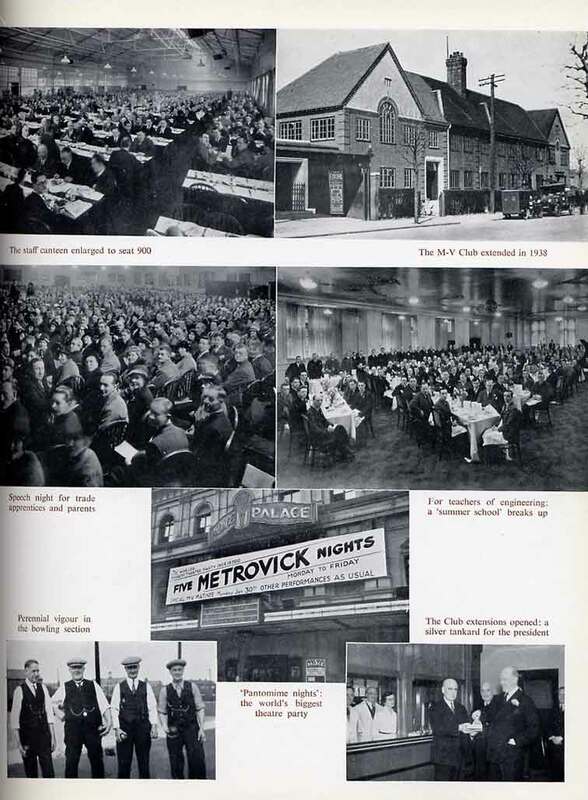 Metropolitan-Vickers began the new phase in its career with its existing works at Trafford Park and Sheffield, with its staff and organization intact, and with five of its former directors—Nash as chairman, Bailey, Cradock, McKinstry and Peck. Financial control was now vested in A.E.I., and the Group companies were encouraged to cooperate on all matters of production, development, and research, an important asset being a new arrangement for the exchange of patent rights and manufacturing information with the General Electric Company of America. Nevertheless, they retained their own identities and management and continued to compete in the commercial field. The same broad lines of policy hold good today. Overseas, the possibility of merging the commercial organizations of the Group Problems of companies was considered, and in India and Australia subsidiary companies were rationalization established to represent A.E.I. ; in Australia the joint company took over the local factories that M-V and others had operated for many years. Another aspect of rationalization was that the Company gave up most of its supplies business and also its special interest in the Cosmos and Harcourts works. A new lamp sales department was set up to deal with lighting work. The stability of the A.E.I. group was soon to be put to a severe test. Soon after its formation there were signs of a slump in trade: unemployment increased, eventually approaching the three million mark, world trade became disorganized and Britain was forced off the gold standard. As a result there was not enough business to keep the works going efficiently. However in 1933 trade began to revive. More orders came in, employment increased, and the works output rose to a record value in 1934. Two years later came the first Government contracts in connection with the rearmament programme, and by 1938 the Company was employing nearly 16,000 people, twice as many as in the worst days of the slump. The worldwide extent of the depression had a considerable effect on export business. Another difficulty was the growth of economic nationalism, which led the Company to start or extend the manufacture of light products in some overseas territories. Nevertheless, much important work was done, particularly for South Africa, South America, and Australia. A comprehensive traction contract was obtained in 1935 for a 3,000-V electrification scheme on the suburban lines of the Central Railway of Brazil: it included multiple-unit trains, substations, overhead line and transmission equipment, electric signalling and point setting, repair workshop and car sheds. Sixty three-coach train units were originally required and were increased by later orders to a total of over a hundred equipments. The signalling installation included power interlocking equipment, all-electric point machines, searchlight automatic signals, and impedance bond track circuits. The Export Company was also active in Poland and Russia. From Poland a £2,000,000 contract was obtained jointly with the English Electric Company in 1933, covering a 3,000-V electrification scheme for the main Warsaw railway junction and adjacent lines. In Russia the extensive work done in the past had won the Company a high reputation with the Soviet authorities, and in 1927 a six-year technical assistance agreement had been entered into with Machinostroi, the only Russian turbine works then existing; here turbine manufacture to M-V designs was established on a large scale under I. R. Cox, the Company's chief mechanical engineer in Russia. In 1931 another agreement was entered into with the State Electrical Trust, covering large turbines and electrical equipment of all kinds. This lasted for seven years during which the Company trained large numbers of Russian engineers, thus contributing to the industrial development that proved so valuable in the last war. It was during this period of close association that in March 1933 there came the dramatic news of the arrest on charges of sabotage and espionage of six M-V engineers employed in Russia. These were Allan Monkhouse, L. C. Thornton, W. L. Macdonald, J. Cushny, C. H. de Nordwall, and A. W. Gregory. In due course the trials took place in Moscow with Vishinsky as prosecutor. Gregory was acquitted, but various degrees of guilt were found against the other prisoners. Shortly afterwards however, they were released and allowed to return to this country, later to resume their work in less exciting fields. A number of important changes in the higher management of the Company began with the resignation of McKinstry, the sales director, at the end of 1930. He had had twenty-eight years' service and was for most of the time associated with export business, eventually becoming chairman of the Export Company; was one of the first to realize the value of overseas trade in providing a base load for the factory even though it might not show a profit on paper. McKinstry was an extremely popular figure whose direct method of approach and friendliness with associates were responsible for much of his success in business. He became deputy chairman and managing director of Babcock & Wilcox and was knighted in 1943. The general management of the commercial departments was taken over by the chairman of the Company, Sir Philip Nash, but in November 1931 he also resigned. On joining M-V as chairman in 1922, Nash had found the electrical industry a new experience, but his administrative ability enabled him to take an objective view without being immersed in detail. His charm of manner made him an attractive personality, and his experience in transport matters was a commercial asset in the settlement of important contracts in the traction field. Though his duties kept him mostly in London he became well known at the works, not only by business visits but also by frequent attendance at social functions. After leaving the Company he was chairman of a large multiple stores until his death in 1936. The new chairman was Sir Felix J. C. Pole, who had become chairman of A.E.I. soon after its formation and had also joined the M-V Board. He had spent his earlier life with the Great Western Railway, where by 1921 he had risen to the position of general manager. P. S. Turner, who with two other special directors', K. Baumann and A. P. M. Fleming, had been on the Board since the previous January, was appointed sales director. In 1937 the comptroller, E. H. W. Cooke, resigned to become managing director of the Daimler Company and a director of the B.S.A. He had done much to assist the necessary capital reorganization in connection with the formation of A.E.I. On Cooke's departure he was succeeded at M-V by his assistant, J. G. Lowe; J. H. Callaghan, accountant at Trafford Park and once a pupil of Paul Einert, went to take over the A.E.I, duties. In 1930 the manager of the Sheffield works, G. H. Nelson, resigned to join the English Electric Company, of which he became managing director and later chairman; he was knighted in 1943. In his place G. H. Fletcher became manager as well as chief engineer at Sheffield, and he still holds these positions. 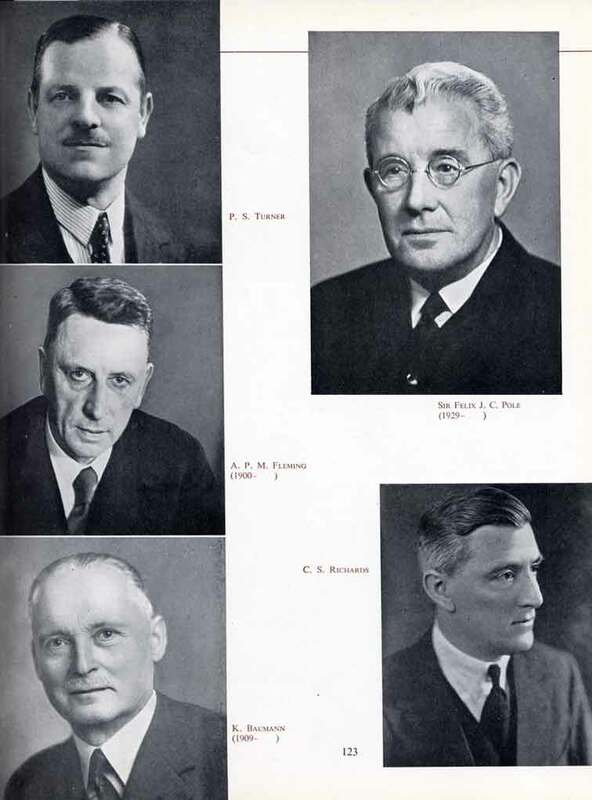 Fletcher was elected President of the Comite Mixte, an international body composed of representatives of electrical and transport undertakings, in 1937, and he joined the Board of the M-V Export Company in 1948. His wide interests in engineering are shown by a number of academic and industrial appointments in the Sheffield district. The contracts manager, J. C. Whitmoyer, retired in 1936 after thirty-two years' service; he had been responsible for some of the largest contracts ever carried out by the Company and had added a reputation for straight dealing to that of a keen golfer. His successor, G. T. King, handled many vital Government contracts during the 1939-45 war. Among the notable distinctions gained by M-V men, one of the most unusual was the award in 1929 of the Lamme Medal of the American I.E.E. to A. B. Field, the Company's consulting engineer. Field, who was for some years professor of mechanical engineering at the Manchester College of Technology, was the first Englishman to receive this honour, an acknowledgment of the importance of his early calculations on the eddy current loss in large slot-wound conductors. In 1930 K. Baumann was awarded the Thomas Hawksley Gold Medal of the Institution of Mechanical Engineers for his paper "Some Considerations affecting the Future Development of the Steam Cycle". Other papers that have gained Hawksley Medals for M-V men are "The Economic Value of Increased Steam Pressure" by H. L. Guy (1927) and "The Utilization of Creep Test Data in Engineering Design" by R. W. Bailey (1935). High honour was also done to Miles Walker, then the Company's consultant, in 1931 and to Guy and J. D. Cockcroft in 1936, when they became fellows of the Royal Society. The trend of Guy's work in the mechanical department, of which he had been chief engineer from 1918, has already been indicated, and the nuclear discoveries of Cockcroft, a former M-V apprentice, will be described later. Lastly, in 1938 A. P. M. Fleming was elected president of the Institution of Electrical Engineers, a pinnacle of professional achievement and a fitting recognition of his pioneer work in the twin fields of engineering education and research. The rapid growth of fabrication by welding required a new tank shop, which was laid out in 1929 by T. Dooley under T. Campbell, the transformer superintendent. The standards engineer was made responsible for a close liaison between the drawing offices and tank shop with a view to helping the draughtsmen to introduce welding into their designs, but three or four years later the greater amount of fabrication made it necessary for each drawing office to have its own welding expert. A welding school was started to give initial training and refresher courses to welders on the Company's staff; this was very helpful during the subsequent changeover from covered electrodes to bare wire. In 1930 G. E. Bailey, appreciating the important part of fabrication in manufacture, inaugurated a separate 'steel products' department with Campbell as its first superintendent. The motor application section of the general engineering department, set up two years before, was made responsible for development work, and an engineer was appointed to coordinate the use of welding in the shops and the design of welding equipment. Many of the new welding sets were given trial runs in the tank shops: the first welded gear-case for steam turbines was made in 1930, and the first combined cylinder and condenser in 1931. By this time transformer tanks, bedplates, yokes, and a variety of other products were in regular production. In 1934 a separate shop was provided for the manufacture of welding equipment. The growth of welding naturally affected the iron foundry. Some of the simpler designs such as bedplates, stator frames, and condenser shells were being fabricated, but the demand for turbine cylinder castings increased and is still large. The foundry turned out its biggest cylinder casting in 1935: it weighed 64 tons and required five ladles to pour it. Condenser shells up to 16 ft 6 inches in diameter were also cast. The original pattern shop still survived, but a growing stock of patterns meant that less space was required for patternmaking; parts of the department were progressively taken over for other work. In 1937 a new pattern shop was built, and the old building was completely occupied by the instrument and meter department. In the motor department E. W. Steele, who had become superintendent in 1919, carried out a complete reorganization, remodelling and re-equipping the test bed, rearranging the machine shops, assembly shops and stores, and overhauling the production side so as to increase output and reduce costs. This work proved particularly valuable as new designs of motor came up for manufacture. A new system of optical inspection was developed in 1936 by A. J. Simpson, later the chief inspector, for measuring small machined parts in large quantities. A comparatively cheap and reliable type of projector was developed, and a number are now used in the works, showing up defects that would go undetected by normal checking methods and saving time by enabling many elements of a component to be checked simultaneously. The trade slump, as we have seen, forced the Company to reduce the number of Effects of its workpeople considerably — from 11,000 to 7,400 between 1931 and 1933. Inevitable distress was relieved from a special fund, set up in 1933 in response to an appeal by G. E. Bailey and financed by voluntary contributions and a grant from the Company. Many will remember the wide open spaces in B aisle, where six-hour shifts were worked for some time in an endeavour to provide employment. In the instrument and meter shops some additional work was found by the manufacture of two new products — a line of miniature instruments inherited from the Park Royal Engineering Company which had been acquired by A.E.I., and a new type of vacuum switch, the sales of which were handled by Sunvic Controls Limited, an associated company formed in 1933. At the Sheffield works, the last portions of which had just been taken over, the worst gaps were filled by the manufacture of a variety of new products ranging from domestic boilers to battery vehicle chassis; there was also a promising newcomer, the 'metadyne'. By 1935 however the position was radically changed, and the works had to be considerably enlarged to deal with the increasing amount and scope of the Company's business. 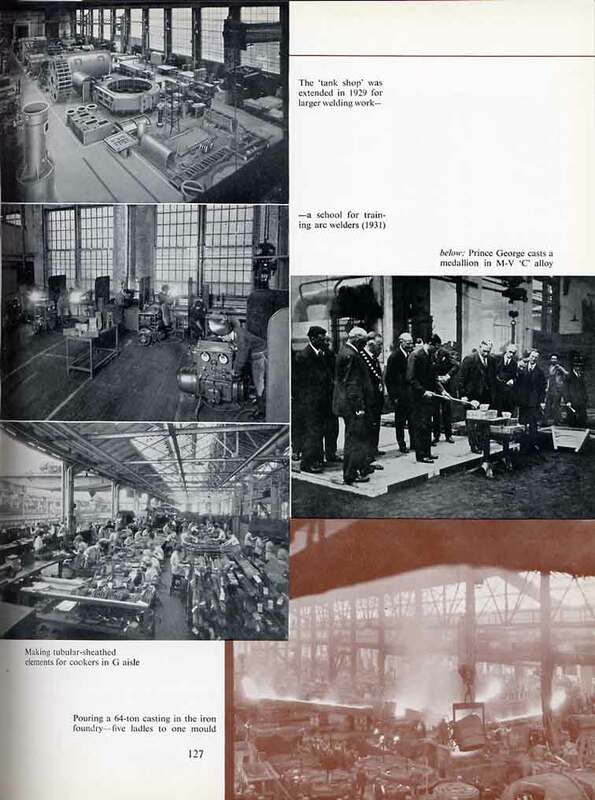 In the following year work began on the first of a series of extensions devoted to making equipment for the Government, culminating in the laying down of an aircraft factory on a site hitherto unoccupied in Mosley Road. Additional office accommodation had been provided in 1930 by the erection of a two-storey west office block, chiefly for drawing offices. While its foundations were being prepared the pile-driver collapsed suddenly, and those working in the adjacent 'Y.M.C.A. huts' had an anxious moment before deciding that it was only a very near miss. Women continued to be engaged in large numbers. The Company had ceased to school employ married women in 1924, and instead it began to recruit from the younger girls, who could be taught M-V methods and later promoted to more responsible jobs. Training facilities were developed by evening classes for the staff and a works training school, which was established by Miss A. G. Shaw, chief supervisor of women from 1933. Here the girls were taught the correct operational movements and the use of tools and machines before they started work in the shops. A preliminary general training period enabled them to be allocated to tasks suited to their special abilities; then followed the correct methods of work and movement and their application to the particular job. Throughout this work the principles of 'motion study' were used. Ever since the 1914-18 war, time study had been an important activity of the process and rate department, where as early as 1920, W. Symes was pointing out that the object was not so much to speed the worker as to cut out useless work. Motion study carried this idea a stage further. Its aim was to increase the efficiency of the necessary movements and to eliminate all others: thus the work could be done with the least effort and inconvenience, that is to say in the most efficient way possible, and output would be increased and fatigue lessened. In 1930 a separate motion study section was set up under Miss Shaw (who was later appointed motion study consultant for the A.E.I. Group). Attention was directed to detail improvements of method in small assembly operations, and an active policy of general education was begun, particularly for the supervisory staff in the shops. Subsequently engineers from various departments were given fulltime courses of training, and schools were established for training operators in motion study methods in general. During 1929-30 the Company lost three of its oldest servants: John Cliffe, H. T. Hunt and John Courtney of the ambulance room, fire brigade and watching staff respectively. Their combined service totalled seventy-five years. Cliffe had in 1926 received the Vickers Gold Medal for general efficiency in first aid, and Hunt as chief officer had made the fire brigade one of the best in any works in the country, winning the Manchester and District Championship Cup over twenty other teams. In 1937 another well-known character left the scene, Ben Spiers, who had served the Company since 1900 and was foreman of 'B machine' for thirty-three years. About 1928 a well-known Stretford doctor, Joseph Robinson, who was also a qualified mechanical engineer, began to be called in for advice on first-aid treatment, particularly for foundry burns, scalds, and sepsis. It was not long before he was attending regularly to supervise the use of artificial sunlight on selected women, and to examine new apprentices and those who were going to tropical climates, giving the necessary inoculations and vaccinations. Qualified first-aid attendants were engaged, and a certificated nurse to supervise treatment; later a women's ambulance room was opened, also with a nurse in attendance. In 1929 when a new fire station was provided, the old building was taken over by the ambulance section. The long-standing campaign to reduce accidents continued, and the increasing number and stringency of the regulations under the Factories Act of 1937 led to the appointment of a full-time safety engineer to work with the existing committee for accident prevention. Trained engineers and inspectors supervise the operation of safety precautions, look for possible causes of accidents or injury to health, and investigate mishaps; they also cooperate with the medical department in maintaining healthy working conditions and in carrying out the statutory requirements regarding machinery, fire precautions, ventilation, heating, lighting, sanitary arrangements, first-aid provision and medical examination. Particular attention is paid to education by booklets, lectures, posters, exhibitions and film shows. All this, combined with a systematic study of accidents and increasing cooperation from the workpeople, has produced a substantial reduction in the number of accidents in spite of the greater complexity and faster tempo of industry. The canteens gradually became more popular, and by the end of 1935 about 4500 meals a day were being served. In the following year new provision was made for work-girls' meals, and the staff canteen was enlarged to accommodate 900 people with a separate room, the 'sergeants' mess', for 120 of the senior staff. A lesser amenity but one not to be despised was the introduction in 1935 of a hire scheme for overalls. The M-V Club continued to flourish, its activities being unchanged by the formation of A.E.I. The Club News, however, ceased publication at the end of 1930; its functions were taken over by the A.E.I. News, a Group employees' magazine the foundation of which was inspired by Sir Felix Pole, himself editor of The G.W.R. Magazine for sixteen years. In 19'38 a 'sick and dividing fund' was inaugurated at the club to provide a more reliable substitute for the increasingly frequent collections for the benefit of sick members or their dependants. In the same year, his tenth as president, G. E. Bailey opened extensions including a new lounge. The annual sports meeting, which had almost always been held at Belle Vue, was moved in 1930 to its present home, the Manchester Athletic Club ground at Fallowfield. Competitors began to be entered from other firms in the Group, and A.E.I, relay races became well established events. The Company's team continued its successful career in the Manchester business houses cross-country championships, run over a course of 5i miles: in the nineteen years up to 1939 M-V won no less than fifteen times (one a tie) and obtained second place twice. Less elaborately organized but very popular diversions were boxing contests, which were held round about 1930 during the lunch hour in the main avenue at the works. With the encouragement of G. E. Bailey aspiring pugilists set to in a businesslike ring for three one-minute rounds, P. Denman being the first master of ceremonies. The Metrovick 'pantomime night' was revived in 1935. The first of these events had taken place in 1920, when the whole of the Palace Theatre in Manchester was booked for the Company's employees and their guests, but the depression after the war prevented its repetition. With the improvement of trade, however, the pantomime night was resumed with increasing success, and by 1938 it had lengthened to a week, tickets being booked for five performances covering over 10,000 seats; it is believed to be the largest block-booking made at any theatre in the country. Royal visitors to the works included Prince and Princess Takamatsu of Japan in 1930 and Prince George on January 12,1931, when His Royal Highness visited the foundry and poured a medallion of himself in M-V 'C' alloy. At Sheffield both works relations and welfare arrangements had steadily improved since M-V took over, developing on similar lines to Trafford Park. From the very early days of the factory, there had been a works committee with an Sheffield associated women's committee (about one-third of the manual workers are women), and welfare schemes of all sorts were gradually set up. A sports association was established, and arrangements made to share the use of a sports ground. Steps were also taken to improve the canteens in accommodation and service. Apprentice training was introduced, and the Sheffield trade section of the apprentice association has a present membership of fifty. In 1929 Kenneth R. Evans, who had been concerned with apprentice training since 1920, took charge of the education department under Fleming, and an important advance was made by the introduction of pre-university works training for intending graduates. On leaving school, these 'probationary college apprentices' came to the works for a year's practical training, during which they were released for one day a week to revise their science and maths; this was supplemented by workshop courses during the long vacation. On coming down from the university, a further year's training at the works completed their apprenticeship. In spite of much opposition at the outset, the work done by the first candidates at the universities did much to convert college staffs, and it is now generally accepted that undergraduates with this practical experience in industry will obtain all the more benefit from their theoretical training. At this time also the arrangements for selecting college and school apprentices were improved by setting up selection committees consisting of departmental and research heads and members of the education department. A little earlier the education department had had the bold idea of educating the teachers of engineering. It was thought that the work of the professors and staffs of university engineering faculties would benefit by closer acquaintance with engineering design and manufacturing practice, and in 1928 the Company held its first summer school. This was attended by 94 'students' from the universities and senior technical colleges of the British Isles. Its success led to the holding of another school on a much bigger scale in 1936, when the attendance of over 200 included also science and careers masters of schools and representatives of the Board of Education and local education authorities. 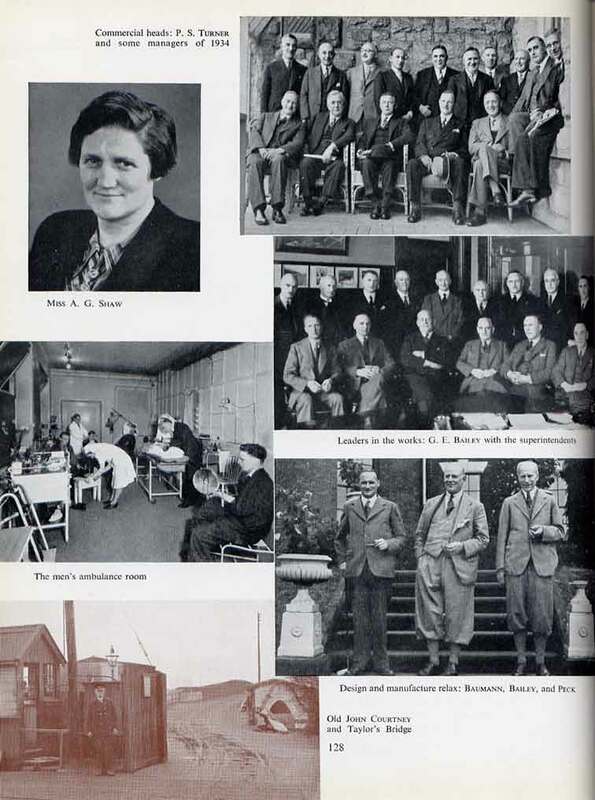 As a result the Board asked the Company to join in the organization of their own summer school for teachers in technical colleges; this, usually held at New College, Oxford, was in 1938 translated to the Trafford Park works, and the whole of the lectures were given by members of the Company's staff. Another summer school is planned for 1950. By 1937 the works school had grown so far beyond its small beginnings twenty-four years before that it was found mutually advantageous for it to be recognized by the Board of Education under the auspices of the Lancashire education authority. The growing amount and scope of research work necessitated a number of extensions, particularly to the high voltage laboratory, which was relied upon at first for commercial testing at the higher voltages. Not until the testing departments in various parts of the works were more fully equipped could the laboratory give more time to its proper work of fundamental and applied research. By 1933 electrical surge or impulse generators had been constructed experimentally for voltages up to three million (in an oil immersed unit). In 1937 the discharge capacitance of the permanent laboratory equipment was increased fivefold by the installation of a two million volt equipment, which replaced the original one million volt generator; this greatly augmented the amount of testing energy available. From 1927 to 1930 the h.v. laboratory had been in charge of B. L. Goodlet, who had started as a trade apprentice at the Sheffield works. Since 1937, except for interludes in the chair of electrical engineering at Birmingham and in charge of degaussing work for the South African Navy, Goodlet has been professor of electrical engineering at the University of Cape Town. He was elected F.R.S.S.A. in 1948. Goodlet was succeeded by T. E. Allibone, a former apprentice who had continued his course at Sheffield University, working on the preparation of rare metals and alloys and later gaining a research scholarship at Cambridge. Allibone persuaded Lord Rutherford to let him work at the Cavendish laboratory on problems of high voltages in vacuum, and following this work J. D. Cockcroft, also an ex-M-V apprentice and former member of the research staff, and E. T. S. Walton went on to their epoch-making achievement of 'splitting the atom'. This work was the culmination of a series of experiments carried out in the Cavendish laboratory, often with the aid of the Company's equipment. From 1923 Cockcroft was working on intense magnetic fields using a unique heavy current generator built at Trafford Park, and later Walton was collaborating with Allibone in experiments using a 350,000-V generator designed and made by M-V and at that time the only one of its kind in the country. In the famous experiment of 1932 a lithium target was bombarded with a stream of very swift protons (hydrogen nuclei), which split the lithium nucleus into two helium nuclei. The atom-splitting protons were accelerated to the enormous velocities required by means of large demountable high-vacuum tubes, equipment only made practicable by the earlier discoveries of C. R. Burch. Previously Allibone had been working on the production of continuously evacuated discharge tubes, intended at first for the acceleration of electrons and capable of withstanding up to half a million volts; improving on the designs evolved in this work Cockcroft and Walton built not only a discharge tube for the acceleration of positive ions but also a continuously evacuated high-voltage rectifier with which to produce a steady potential of 800,000 V starting with a transformer voltage of 200,000. The combination of these two pieces of apparatus made possible the successful results of the atom-splitting experiments. From 1932 onwards Cockcroft contributed to most of the major achievements of the Cavendish laboratory, and in May 1939 he was appointed professor of natural philosophy at Cambridge, having been previously elected a fellow of the Royal Society. When war was declared his advice was in urgent demand by Government departments-as director first of the Air Defence Research and Experimental Establishment (later the Radio Research and Development Establishment) of the Ministry of Supply, and then of the Montreal laboratory of the National Research Council of Canada. In 1946 he was appointed director of the Atomic Energy Research Establishment at Harwell, and in 1948 he received a knighthood. Meanwhile, in the high voltage laboratory at Trafford Park work on the mechanism of the arc discharge was initiated by Allibone in 1936, and fundamental research on lightning was carried out between 1932 and 1939, extensive field observations being made in South Africa by F. R. Perry. A third field of investigation was that of high voltage x-ray tubes, in which continuous evacuation had great advantages. Sealed-off tubes were short-lived and expensive to replace, whereas in a continuously evacuated tube it is only necessary to replace the filament or the target; with sealed-off tubes it was also very difficult to obtain the high voltages necessary to give radiation of the intensity and wavelength required for deep therapy work. In 1930 therefore, work started with the object of producing high voltage x-ray tubes for medical work and crystallography. First a 250-kV medical tube was developed in the high voltage laboratory, and by 1934 two had been put into operation in the Sheffield Infirmary; these were so successful that further equipments were made, including four for the Christie Hospital in Manchester and four for the Middlesex. Later several tubes of similar design but operating at 500 kV were put into service. Early in 1936 an equipment working at a million volts was attempted, and in November of that year it was installed in St. Bartholomew's Hospital; it has been in service for many years operating at 1,100,000 volts. On the crystallographic side the first continuously evacuated x-ray tube was produced by C. Sykes, whose main object was to be able to change the target fairly easily. It was provided with interchangeable water-cooled targets, and its success led to the design of commercial models, which soon became a standard product— the well-known Raymax equipment. Later developments included powder cameras, x-ray spectrometers, and crystallographic equipment having the extremely fine focal spot of about 0-4x0-04 mm, which permits the study of single crystal and crystal boundary conditions. These were the foundations of the Company's x-ray business, now handled through Newton Victor Limited. The electron microscope arose from the necessity to transcend the resolving limit imposed on the optical microscope by the physical nature of light. The substitution of a beam of electrons for a beam of light was suggested, and by 1930 work had started in the research department. The first British instrument was designed in cooperation with Professor L. C. Martin of the Imperial College of Science and Technology, where it was installed in 1936. Further development was held up until after the war, when, much improved instruments were designed and built. Continuously evacuated radio valves of high power had been investigated by C. R. Burch's colleagues, who built by 1930 a triode of demountable construction for an input power of 25 kW. So satisfactory was it that the G.P.O. asked for a 500-kW valve to replace an existing bank of fifty-four sealed-off valves in the Rugby wireless station: with an overall weight of 33 cwt, this valve was easily the largest in the world. Following further work by F. P. Burch (a brother of C. R.) and later J. M. Dodds, other continuously evacuated valves were introduced for G.P.O. service, and a short wave tetrode was added to the range. Sealed-off valves for short wave operation were also made, and four were used in power stages of the Baird transmitter, one of the two original television transmitters installed at Alexandra Palace in 1936; this apparatus was operated at wavelengths down to 6 metres in the world's first regular television programme. A 60-kW tetrode valve, another outcome of C. R. Burch's work, was in operation with the G.P.O. when the head of the radio department at the National Physical Laboratory, R. A. Watson Watt, was starting his experimental station at Orford for work on radio direction-finding (r.d.f. ), later known as 'radar'. One of his first difficulties was the production of stable high-frequency radiation at very high power, An experimental transmitter had been built in the Company's research department to find the minimum operational wavelength for the tetrodes, and Watson Watt was invited to see tests carried out on these valves, which were delivering to an aerial a power of more than 100 kW at 55 Mc/s. As a result of his report the Air Ministry asked the Company in October 1936 to quote for a number of valves and also accepted an offer of assistance in the design of their transmitters. In the following March, M-V was initiated into the r.d.f. programme, and work started immediately under the technical supervision of J. M. Dodds on the design of the CH (chain home) transmitter. On June 11 there came a verbal instruction to proceed; in July a contract was placed for two transmitters, and in November it was increased to cover forty transmitters, the whole of those required for the early warning system for the air defence of Great Britain. Each transmitter was to incorporate the Company's continuously evacuated valves, which were the only ones that could give the high powers necessary at the wavelengths required. This was the first of many war contracts for all sorts of radar equipment. 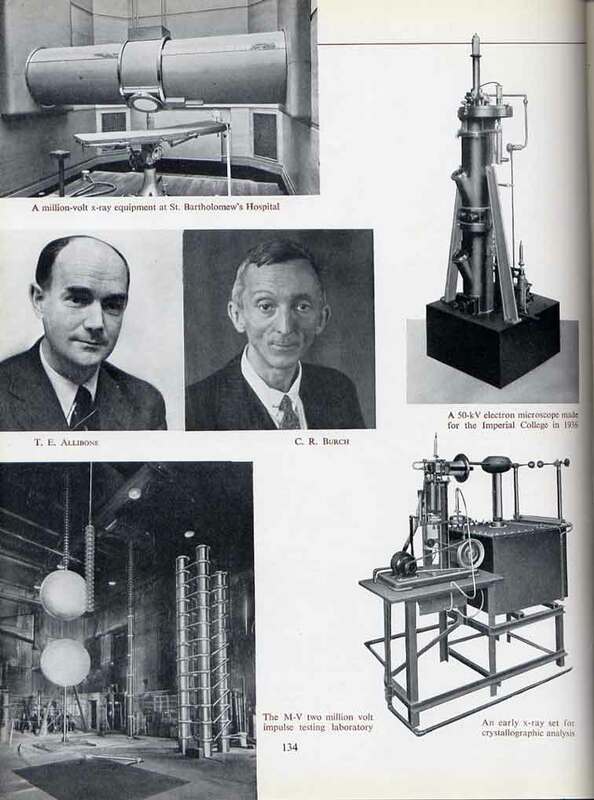 Much of the research work of this period was rendered possible by the use of continuously evacuated high vacuum apparatus, which itself was due to one of the many discoveries made by C. R. Burch in the M-V research laboratories. In 1933 however, Burch left the Company, having accepted a Leverhulrne fellowship in optics at the Imperial College, and three years later he moved to Bristol University, where he is now a fellow of the H. H. Wills physics laboratory. In March 1944 he was elected an F.R.S. on account of his contributions to science especially in connection with the obtaining of high vacua. Important though less spectacular was the work carried out on properties of magnetic materials, and the subsequent investigations on machines and transformers. For example, methods were developed for measuring pole-face losses in rotating machines and stray losses in transformers and, under F. Brailsford, for the direct measurement of rotational and alternating hysteresis loss on small specimens. The preferred orientation of crystals, particularly in the newer cold-rolled silicon transformer steels, was determined magnetically. Crack detection work resulted in the development of apparatus suitable for routine testing, and by 1934 the requests from other firms were leading to the manufacture of magnetic crack detection equipment on a small scale. A consulting and inspection service was organized for industrial use. Non-destructive methods were also developed for testing non-ferrous metals, for example a fluorescent method which can be applied to practically every material. About 1930 the investigation of the failure of a railway tyre in service led to the discovery by C. Sykes of 'order-disorder transformation', which aroused considerable interest in academic circles. This phenomenon, which is quite common in alloy systems, is a rearrangement of the atoms within the solid solution: in an iron-aluminium alloy, for instance, either the aluminium atoms may be distributed at random among the iron atoms, or they may alternate on the cube corners of the body-centred lattice giving an ordered structure. The rearrangement is caused by heat treatment and was first detected by the change in the electrical resistance of an iron-aluminium alloy containing 25 per cent of aluminium by atoms; its cause was confirmed by x-ray work. This discovery appears to have escaped notice because the sensitive physical methods of examination—x-ray analysis, electrical resistivity and specific heat measurement—were not normally used. Work on refractory materials was of practical value for the tips of cutting tools, where an alternative was desired to the sintered tungsten carbide obtainable from the Continent. Research work on titanium carbide began in 1931, and in the following year sintered carbides were being made on a modest scale in the research department under P. P. Starling. By 1938 a range of these hard metals, later known as Cutanit, were available in the quality and consistency required and were being sold in an increasing volume, mainly for tool tips. Further research by Sykes and T. Raine on the basic powders used rendered this country independent of continental supplies before the war began, and manufacturing methods were rapidly developed and plant installed, mostly employing new and superior processes. This work had invaluable results in war-time. Sykes, who had been in charge of the physics laboratory, left in 1940 to be superintendent of the metallurgy department of the National Physical Laboratory. He became an F.R.S. in 1943 and is now director of research at Thos. Firth and John Brown Limited. Another development in new materials was Metrosil, the resistance of which exhibits a remarkable departure from Ohm's Law: by doubling the voltage applied to it the current is increased twentyfold. In 1937 a small manufacturing section was set up in a laboratory for the production of this material under controlled conditions. As a non-ohmic resistance Metrosil had an obvious field in lightning protection, and this application was rapidly developed. Gradually its uses were extended, and they now cover a wide range from 132-kV surge diverters to telephone and radar equipment. Research on electrical insulating materials was directed in 1937 towards better heat-resisting qualities, and the use of glass insulation on high-duty machines was investigated, both alone and also impregnated with a synthetic resin such as glyptal. In the following year the laboratories began to manufacture, on a small scale, a range of insulating varnishes and impregnants and also a wide range of special priming and finishing paints. Testing equipment continued to be produced and manufactured in the research laboratories for use in the works and outside. 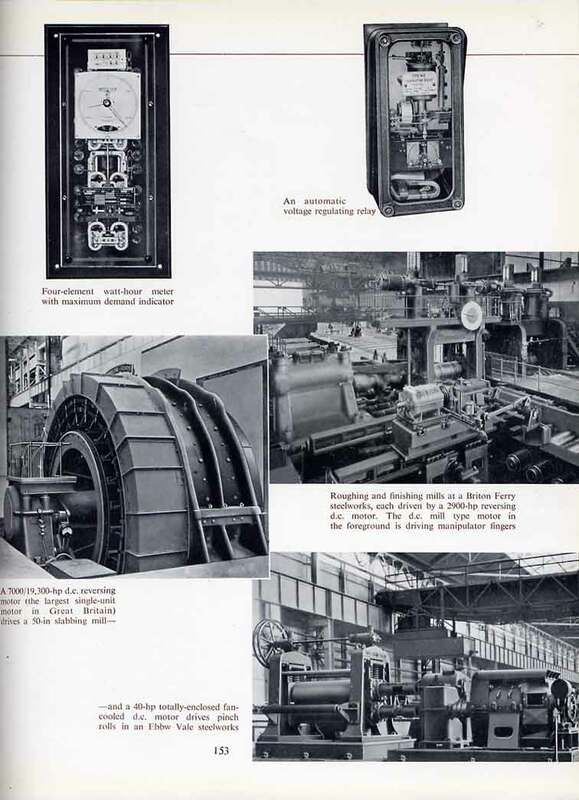 Examples of apparatus developed from 1930 onwards are Schering bridges and discharge bridges for testing condenser bushings and other electrical equipment, turns counters and short-circuit testers for coils, condenser discharge magnetizers for permanent magnets, plating and paint thickness gauges, transmission dynamometers, and finally turbine supervisory equipment for the continuous recording of bearing vibration, shaft eccentricity and differential expansion. More elaborate was a complete sixteen-element electromagnetic oscillograph made in 1934 for the Switchgear Testing Company. Special apparatus was designed for the electrical recording of instantaneous fluid pressures in oil circuit-breakers under short-circuit conditions when currents of the order of 300,000 A may be encountered, and this involved unusual problems of interference. In 1931 a high-speed continuously evacuated cathode ray oscillograph with potential divider was designed and constructed by F. P. Burch and R. V. Whelpton, primarily for studies on surge phenomena; it operated with an accelerating voltage of 50 kV and was notably reliable and easy to work, becoming the forerunner of many equipments now in service. 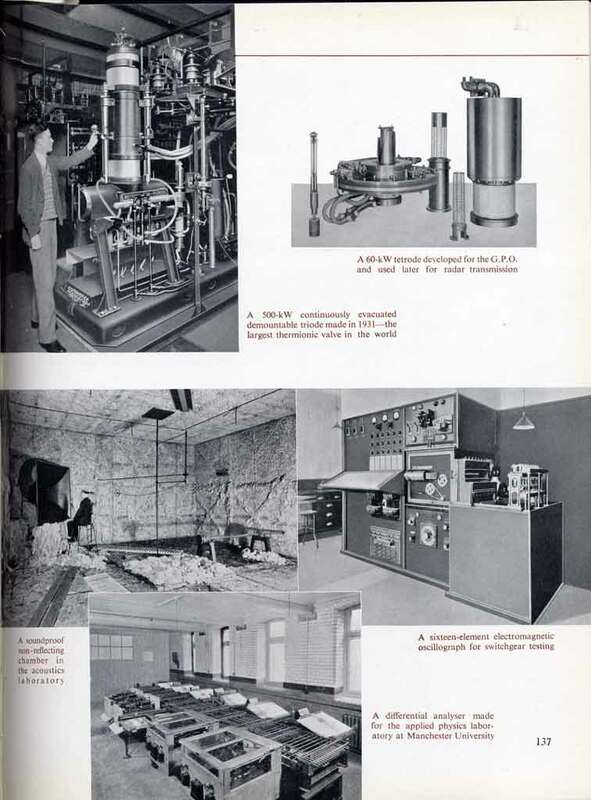 A highly specialized piece of equipment produced for scientific workers in an allied field was a differential analyser, having eight integrating units. Built in 1934 for the laboratory of applied mathematics at Manchester University, this was the first large precision machine of its type in the country. Some years later a similar machine was supplied for the mathematics laboratory at Cambridge. GENERATING plant continued to increase in size and efficiency, and side by side with the Company's technical developments came a greater capacity for carrying out comprehensive installations. An example is a contract completed in 1931 at Montevideo. M-V was the main contractor for the first portion of a power station designed for an ultimate capacity of 120,000 kW, the initial installation comprising two 25,000-kW 3000-r.p.m. 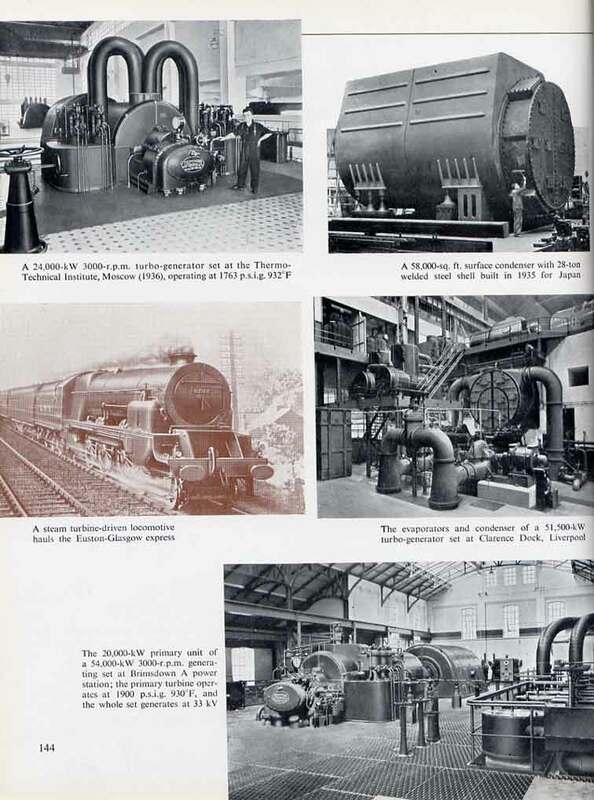 turbo-generators and four oil-fired and four coal-fired water tube boilers. The contract was completed in record time, only sixteen months elapsing between the placing of the order and the starting up of the first set; the overall guarantees for the station as a whole, based on the calorific value of the oil or coal used against kilowatt-hours at the outgoing feeders, were completely fulfilled. Steam turbine progress was conspicuous both in machines for use under the prevailing operating conditions and in units for operation at 'super pressures'. The arrangement and design of feed water system auxiliaries — heaters, evaporators and de-erators — were further developed. Manufacturing methods exhibited a notable advance in 1930, when the first turbine blades were produced by cold rolling. he process was based on the original theories of E. G. Brownlow, under whose supervision it is still carried on; besides economizing in time and material, it enables highly finished blade forms to be produced with great accuracy. During the nineteen-thirties the larger turbines from 35,000 to 60,000 kW at 1,500 r.p.m. continued to be made, and also a growing number of self-contained units' both condensing and Pass-out types, for outputs from 250 to 6000 kW. A three-cylinder 105,000-kW 1500-r.p.m. turbine installed in the Battersea power station in 1935 is still famous as the largest single-axis unit ever built in Europe. This machine has a low pressure cylinder of the double flow type with a multi-exhaust in each flow and is equipped with central-flow twin condensers and five-stage feed heating incorporating a single-effect evaporator. The Battersea set represented, perhaps, the final development of the straightforward 1,500-r.p.m. machine, and thereafter much work was devoted to increasing the output obtainable at 3,000 r.p.m. A range of modern 3,000-r.p.m. turbines was developed from two machines, a 6,500-kW condensing unit and a 7,500-kW pass-out unit, built in 1933. These turbines were subsequently made in outputs up to 24,000 kW for large industrial plants and for the smaller power stations at home and abroad. For general power station practice a two-cylinder 3,000-r.p.m. turbine with a double-flow low pressure cylinder was designed, and in 1934 four 33,000-kW units of this type were put in hand, three for the Klip power station in the Transvaal and one for Belfast. Since then more than forty turbines of the same type have been ordered. At Klip twelve similar sets were installed altogether, giving (with four 7000-kW house sets) an aggregate capacity of 424,000 kW; in 1940 no less than 2,566 million units were sent out, considerably more than from any British station. The use of double flow construction depends, however, on the conditions at the exhaust. For moderate vacuum and steam quantity it is possible to use a single-flow low pressure cylinder with a multi-exhaust, and after experience had been gained in rebuilding the two-cylinder sets at North Tees for 50-c/s operation three 30,750-kW 3000-r.p.m. turbines of this type were designed and installed at Manchester, and another at Croydon. Steam conditions were to be notably changed as a result of pioneer work by Baumann, Guy, and their assistants on the economic benefits obtainable from higher steam pressures. Inlet steam conditions of 600 p.s.i.g. and 800-850°F had been the accepted practice, and the limiting factor was the maximum temperature that could be employed with the materials available; to advance pressures without a corresponding increase in temperature would have resulted in excessive condensation in the exhaust stages. Accordingly much work had been done in the research department on the behaviour of metals subjected to high steam temperatures. 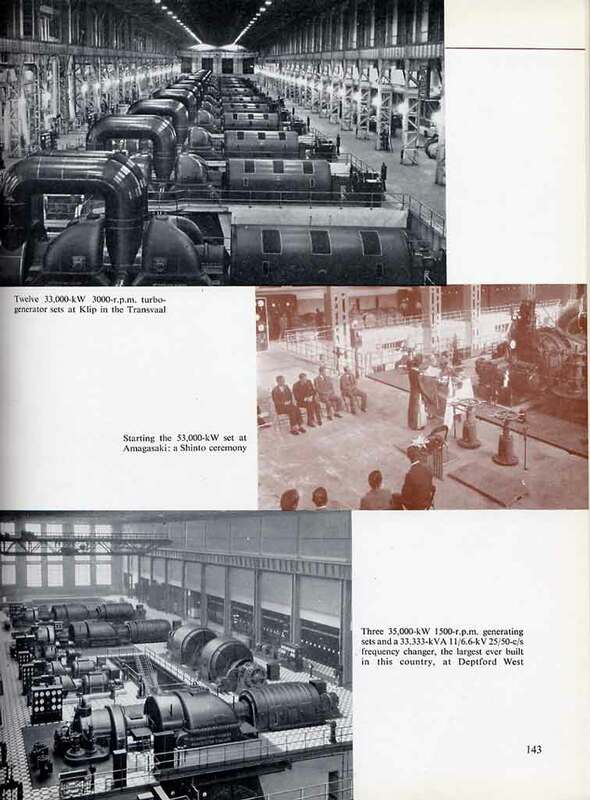 The Company was now in a unique position in the manufacture of high temperature turbine plant, and in 1932 it designed for the Thermo Technical Institute in Moscow a 24,000-kW 3000-r.p.m. turbine for 1763 p.s.i.g. 932°F, exhausting at 373 p.s.i.g. In 1935 a 54,000-kW 3000-r.p.m. two-axis machine for steam conditions of 1900 p.s.i.g. 930°F was put in hand. This plant for the Brimsdown A power station consisted of two-cylinder units, a 20,000-kW primary turbine and a 34,000-kW condensing turbine. Four years later similar plant of 60,000 kW capacity was ordered for the Brimsdown B station. In the allied field of turbo blowers, machines of 50,000 c.f.m. capacity were made with inlet and outlet casings of fabricated construction. The same type of impeller construction was employed on three turbo compressors ordered in 1932 for Russia, the largest unit having nine stages and compressing 26,500 c.f.m. of free air to 100 p.s.i.g. Manufacture of large fans began in the same year, and since then radial flow fans with outputs up to 100,000 c.f.m. for discharge pressures up to 20 inches s.w.g. have been made, and axial flow fans with outputs up to 200,000 c.f.m. both single and multi stage. For marine propulsion four 27,000-s.hp geared turbines were built in 1937. These were a striking example of fabricated construction, which extended to the low pressure cylinder casing, the condenser, and the main part of the gear-case. In an exhaust turbo-electric propulsion system developed in conjunction with the Ellerman Line in 1930, the exhaust steam from the main reciprocating engine was passed through a low pressure turbine, where it expanded to a higher vacuum; this enabled the turbine to drive a d.c. generator feeding a propeller motor, which supplemented the power from the main engine. The first installation in the City of Hong Kong and twelve more were made for the Ellerman Line, and two equipments for the United Fruit Company; some of these are still in service. The exhaust turbo-electric system enabled the greatest possible use to be made of the steam and was technically very successful. However, its high first cost and the obsolescence of the reciprocating engine prevented it from being used further. A turbine application of historic interest came in 1935, when the L.M.S. express locomotive No. 6202 was completed at Crewe. This was a turbine-driven non-condensing locomotive having the novel feature of separate forward and reverse turbines, which with triple reduction gears and steam controls were made by M-V. The locomotive had a maximum design speed of 90 m.p.h. with train loads of 500 tons or more, and it has completed over 400,000 miles running, mainly on the Euston-Liverpool express passenger service. Dynamometer car tests over a 402-mile run from Euston to Glasgow showed that the coal consumption per drawbar hp-hr of the turbine locomotive was better than a standard Princess Royal engine, but its outstanding quality is quiet smooth running and freedom from vibration. The largest turbo-generators built during the period were for the new Battersea power station: an 80,000-kVA 1500-r.p.m. generator installed in 1931, followed by a 111,111-kVA 1500-r.p.m. generator in 1935. This giant machine was for many years the largest in Europe and British manufacturers have yet to build a generator of greater output. The stator with concentric end windings weighs 148 tons, and the rotor with a diameter of 4 ft 10 in and made up of three forgings weighs 85 tons. The 6250-kVA 3000-V house service generator and three exciters are mounted on the same bedplate as the main set; they can be uncoupled and moved aside to allow the rotor of the main generator to be withdrawn from the stator. 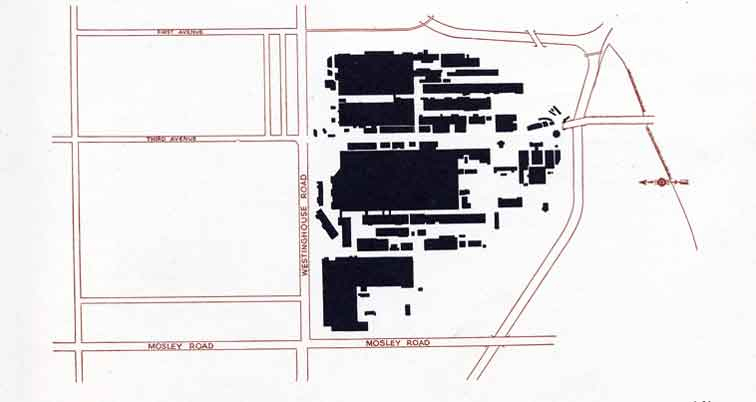 With these increasing sizes the farseeing plan on which the original factory was built became apparent. The use of 'zero power factor' or wattless load testing enabled full-load heating tests to be carried out on the largest machines with a remarkable economy of power. An important development was the introduction of generation at 33 kV, the turbo-generator stators being wound for this voltage and connected to the supply system without transformers. In the Company's design the concentric end windings are arranged with each phase completely separated from the other by a generous air space and with the end connectors joined to the slot conductors by ample curves, enabling the joints to be satisfactorily insulated for the full working voltage. A 66,666-kVA generator of this design — due to G. A. Juhlin — was put into commission at the Clarence Dock station, Liverpool, in 1937. Since then over three-quarters of a million kVA of 33-kV generators have been manufactured, and machines totalling a further 632,000 kVA are now on order. The first generator yoke having dovetail bars of bright steel welded into position was built in 1931; the introduction of welding eliminated machining of the bore of the yoke, thus enabling still larger generators to be developed. Apart from the wide range of large generators for power supply, two machines have special claims to remembrance. The first was a 33,333-kVA frequency changer, the biggest ever built in this country, which was installed at Deptford power station for interconnecting the 25-c/s and 50-c/s systems of the London Underground railways. The second was a 60,000-kVA 3000-r.p.m. 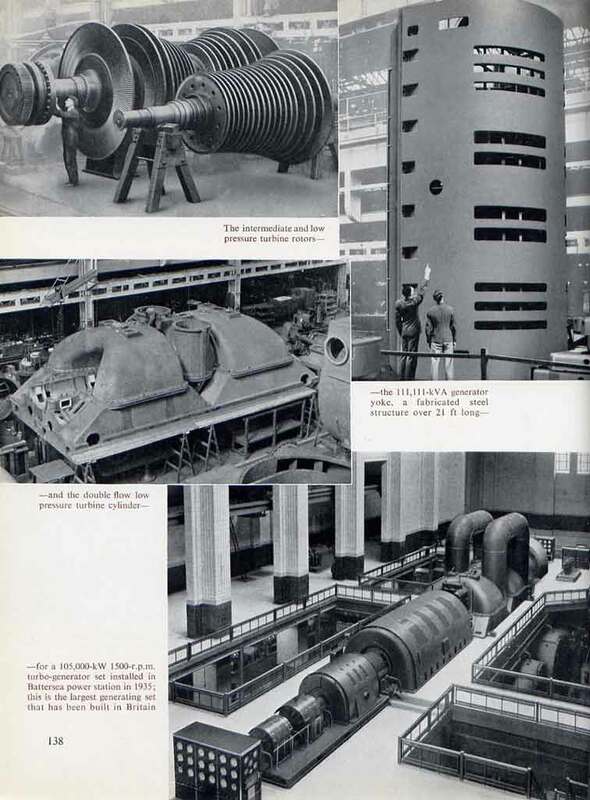 generator designed to give initially 2,500,000 kVA asymmetrical at low power factor when short circuited; this was built for the testing of large oil circuit-breakers in the switchgear testing station of A.E.I., and a duplicate was made in 1939. Electric propulsion equipment was manufactured for four ships operating on the Diesel-electric system. The first was a double-ended ferryboat supplied to the Argentine Government in 1929 and having a total power of 800 hp. This was followed in 1932 by a Clyde passenger vessel, the Loch Fyne, which was the first Diesel-electric ship to be put into service in this country. Two years later came the Firth of Forth ferries Queen Margaret and Robert the Bruce; these were peculiar in having a Diesel-electric drive for paddlewheels—still an uncommon arrangement. Large three-phase transformers were made from 1931 onwards, starting with 30,000 and 45,000 kVA units for 132/33-kV service on the 'grid' and 75,000-kVA U/66-kV units for the new Fulham power station. A 40,000-kVA 33/11-kV unit built for Sheffield in 1932 was fitted with banks of radiators and is still one of the largest self-cooled transformers. A 35,700-kVA 11/33-kV transformer for Clarence Dock, Liverpool, was constructed in five-leg form to suit the limited headroom. The scope of on-load tap changers was extended in 1938 by the development of the first British equipment for use with high voltage transformers having fully insulated neutral points and subject to the full test of twice the system voltage. This design now established for systems up to 250 kV, has been used on transformers made by M-V and others for New Zealand, India, Russia and elsewhere in Europe. With the increasing use of high voltage systems, investigations into insulation materials, the impulse voltage strength of windings, and the ability of transformers to withstand short-circuit stresses were intensified. The principal insulating material was and still is high grade pressboard, manufactured under the control of the research department; this material is now supplied not only to most British transformer makers but also to other parts of the world. Closer cooperation with the manufacturers of transformer steel was successful in producing core steels having lower losses. For installation underground in collieries the Company developed in 1932 (on behalf of B.E.A.M.A.) a small flameproof tank for 5-kVA single-phase and 3-kVA three-phase transformers; this became a national standard. In the following year came an important innovation: the mining Transwitch equipment, which as its name implies is a combination of transformer and flameproof switchgear and is designed to be moved forward as the coal face advances. The cross-jet explosion pot took some time to perfect, and when 66-kV metal-clad gear was ordered for Battersea A station it was decided to use circuit breakers with double quick-break contacts. This installation of 1932 set the modern fashion of placing breakers, isolators and busbars in separate fireproof rooms. Another innovation was the use of armoured condenser bushings for all busbars and interconnections. Thus the conductors in each phase were encased in earthed metal, and terminals on each bushing enabled the condition of the dielectric to be tested while the gear was alive. The control board had a mimic diagram, which was completely illuminated, the changing colours giving a continuous indication of the state of the apparatus and circuits. Extensive tests on the cross-jet pot confirmed the theory that one of the two breaks in a conventional breaker did most of the work. This led D. R. Davies to introduce single-break metal-clad gear, the first example of which was installed in the London Power Company's 66-kV substation at Grove Road in 1934. The original design required only minor changes, and competitors, who had condemned single break almost unanimously, followed the M-V lead—without however robbing the Company of the leader's share in the business. In outdoor switchgear the 165-kV circuit breakers with oil-blast pots supplied in 1932 for the Dnieprostroi system in Russia gave a further lead to British manufacturers. However, these very high voltage breakers used a great quantity of oil, and shorter opening times were becoming essential for maintaining stability on large interconnected systems. Both objections were met by C. H. Flurscheim's impulse circuit breaker, which was used on an installation at Lydney in 1938 and again at Littlebrook in 1940. Here a single break was mounted at one end of an oil-immersed condenser bushing, and the oil was mechanically forced across the contacts at the instant of operation. Although this design was later replaced by the simpler air-blast breaker, it is still one of the fastest 132-kV interrupting devices ever built. None of these ventures could have been attempted with only limited access to generators that happened to be on test. Towards the end of 1932 a welcome palliative was provided by two old 25-c/s generators, which were installed on dynamo test for the use of the switchgear engineers, and in 1934 came a great advance— the building of an A.E.I, switchgear testing station on land adjoining the west works. Designed by the Group companies concerned and owned and operated by an A.E.I, subsidiary—the Switchgear Testing Company Limited—the station is one of those approved by the National Physical Laboratory as competent to issue certificates of circuit-breaker performance. It has enabled the Company to check all new designs of switchgear and thus ensure the high degree of reliability that is essential on the interconnected systems of today. The equipment of this testing station had to be specially designed to withstand severe electrical and mechanical stresses due to repeated short circuits. That the special generator and a 25,000-kVA 260,000-A testing transformer originally supplied by M-V are still in use is fair evidence of good design and workmanship. Instrument and meter developments were headed by the redesign of the whole range of switchboard instruments to fit into sheet steel cases, a departure from British practice that resulted in large sales of instruments to other switchgear manufacturers. Next came a revised design of watt-hour meter having an improved electromagnetic system and at first a cast iron frame, case and cover; by 1934 bakelite cases and covers had been developed, and large moulding machines were installed. Soon afterwards came a die-casting section for making instrument parts from zinc-base alloys, using automatic plant developed for the purpose. Between 1934 and 1938 new prepayment mechanisms, voltage regulators, and protective relays were introduced, and the house service meter was provided with refinements such as micrometer adjustments and accuracy over an increased range. 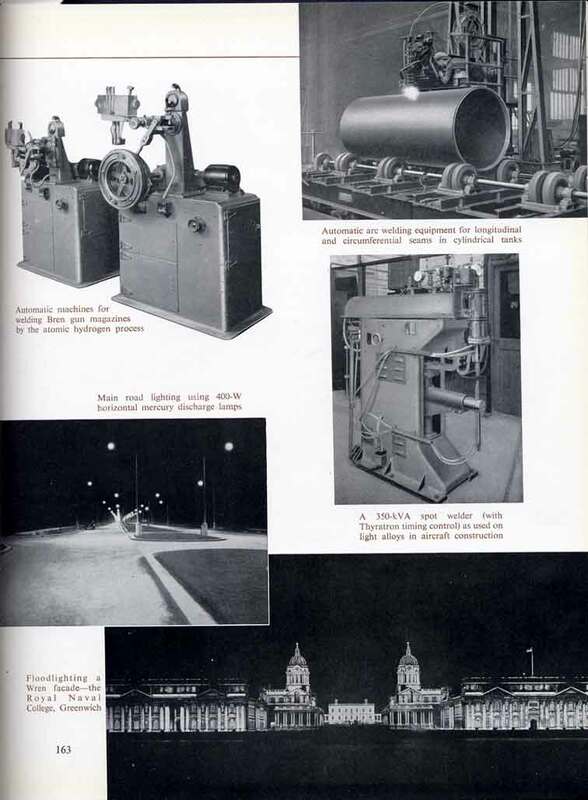 From about 1937 the electricity supply industry showed new interest in the use centralized ripple control for off-peak loads, street lighting, and so on. The Company developed a novel type of ripple receiving relay, which was tested on many public supply networks with promising results, and a complete 'Ripplay' equipment was made and installed at Blackpool in 1939. The larger motors for heavy drives, particularly in steelworks and collieries, forged rapidly ahead. In 1933 a system of variable automatic excitation was developed for synchronous induction motors; part of the excitation is controlled automatically by the load current, enabling a motor of high efficiency to deal with heavy overloads without falling out of step. The first of these' VAX' motors was applied to a rolling mill where the peaks were as high as twice full load. 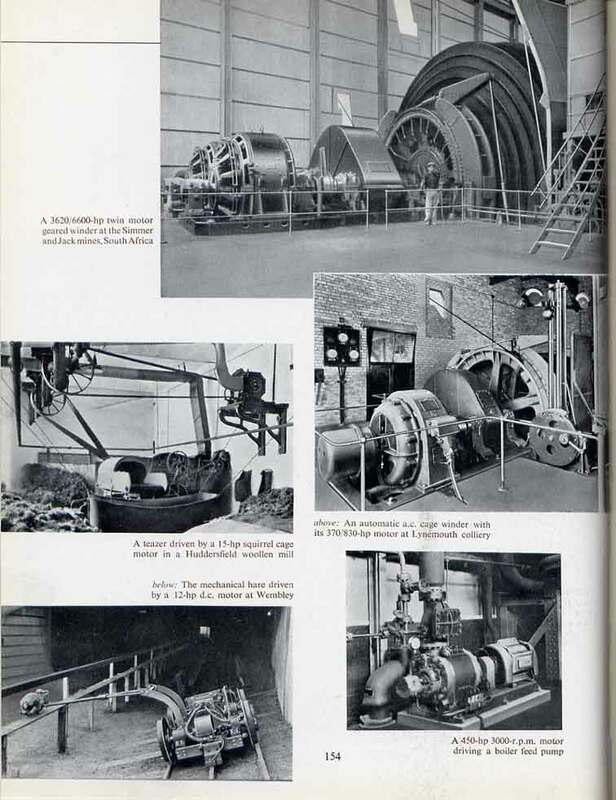 In the same year d.c. equipments having a maximum operating peak of 25,000 hp were installed at the Corby steelworks, and an induction motor 18^ feet in diameter and having a peak rating of 3940 hp at 70-5 r.p.m. was supplied to a rolling mill in Russia. 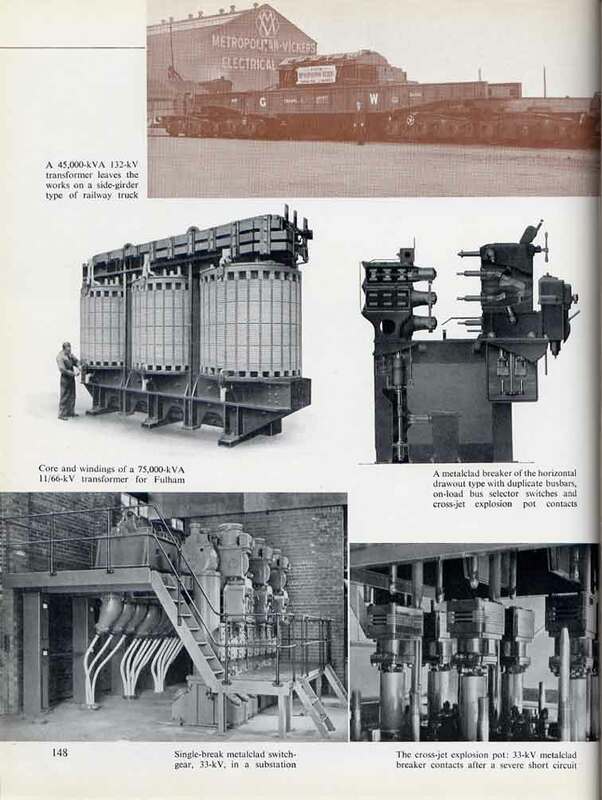 In 1938 a 7000/19,300-hp d.c. reversing mill motor was installed in a new steel plant at Ebbw Vale; it was the largest single-unit mill motor that had been made in this country. For the control of d.c. rolling mill motors G. A. Juhlin and E. P. Hill introduced a load-limiting excitation scheme in 1936. This simplified the control gear by reducing the number and size of the contactors required and enabled rolling mills to be rapidly reversed without causing excessive currents in the driving motors. About sixty of these equipments have been supplied for rolling mill and other applications. In winding engines the Company had for many years secured by far the largest part of the business placed in this country and indeed in most parts of the world. One outstanding installation — at the Simmer and Jack mines on the Rand — ranked in 1935 as the largest multi-compartment single shaft winder in the world. It consisted of three 3620/6600-hp units installed in one hoist hauling from a depth of 6400 feet. Each unit had a bicylindroconical drum, 35 feet in diameter, driven by twin motors through pinions and a common gear-wheel. With this unrivalled experience in winding equipment, generally as main contractor for both the electrical and mechanical parts, the Company was in a good position to originate improvements. 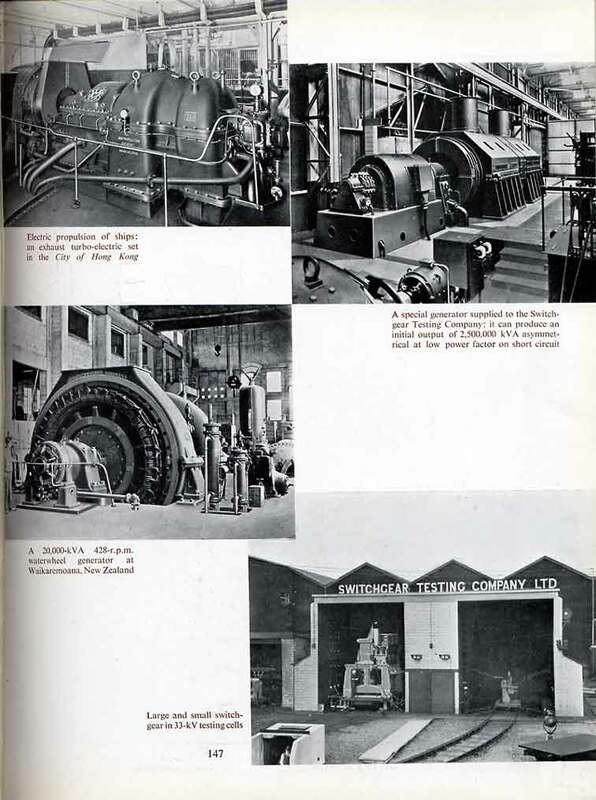 From 1930 onwards a series ot innovations from Trafford Park has influenced electric winding practice everywhere. Braking problems, particularly those encountered in metalliferous mines abroad, were attacked from several angles. On double-drum winders the regulations governing braking power on each drum are very stringent, and with balanced winding the sudden application of both brakes can have a violent effect on drums, ropes and cages. To avoid this and the consequent risk of injury to the men being wound, the Company designed an automatic brake governor, which under any conditions of balance prevents the brakes from being applied with more force than is necessary to produce a safe rate of slowing down. This governor is now used generally throughout the industry. For a.c. winders a great advance was the introduction of dynamic braking, which extended their range to powers of 3000 hp or so, much higher than was otherwise possible. Loads were usually lowered under the control of the mechanical brakes, and in order to relieve them expensive hydraulic brakes of the dynamometer type were being installed on high-power deep shaft winders. Dynamic braking provided an alternative method that was both reliable and easily controlled. When braking, the motor is isolated from the supply, and its stator connected to a d.c. exciter; by varying the d.c. excitation the braking characteristic can be made to follow the load requirements. The control of a.c. winders thus becomes as easy as that of Ward Leonard equipments, and the M-V system, first used in 1937 on the service winder at the new Comrie colliery in Fife, was subsequently adopted by all manufacturers of a.c. winders, both in this country and America. In 1937 the British mining regulations regarding landing speed for men were made more stringent, and the Company developed a compound braking system for use by the makers of the mechanical parts. The traditional British and American methods employed a single-power vertical braking engine, which could cause objectionable and sometimes dangerous shocks to the equipment and also to the men-in the cage; the use of damping devices involved a sacrifice of speed in the application of the brakes and depended too much on proper adjustment and maintenance. The M-V compound brake system applies a moderate braking force gently and rapidly (by means of tension springs under independent control) and retains the advantage of dead-weights as the main source of braking power. 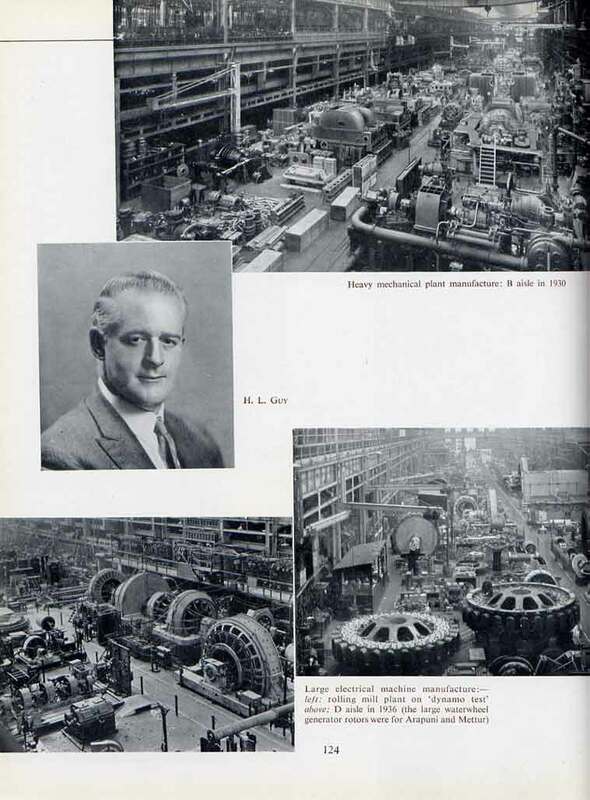 Some years earlier another M-V development had made it possible to employ synchronous motor generator sets on Ward-Leonard winder equipments. This was the use of an hydraulic slip coupling between motor and flywheel, controlled in such a way that the speed of the motor remained constant while that of the flywheel and generator fell on increased load, thus allowing the flywheel to give up its stored energy. In this way power factor correction was made available without recourse to the Scherbius system, a complicated matter of many machines and elaborate brush-gear. The first installation was put in at the Roan Antelope copper mines in Northern Rhodesia in 1930, and most of the large equalized winders in Rhodesia and Australia are now equipped with hydraulic couplings. At the same time a system of automatic winding control was being developed chiefly for use on skip winders in metalliferous mines overseas. For Ward-Leonard equipments it was a comparatively simple step from supervisory control by cams to semi-automatic or indeed fully automatic control, though the need for exact decking with varying skip loads presented some tricky problems. An automatic winding equipment, the first in the world, was installed in 1931 in a zinc and silver mine at South Broken Hill, Australia, and is still in satisfactory operation. It was followed by other sets in Australia and, in later years, at the copper mines of Northern Rhodesia and the gold mines of the Witwatersrand; the skip winding plant at Bickershaw colliery in Lancashire is similarly equipped. Automatic control was also developed for a.c. winders, and in 1935 an installation was put in at Lynemouth colliery, which is believed to possess the only completely automatic a.c. hoist. Electrical equipment for Sperry gyro-stabilizers had been manufactured in 1921 for a British destroyer, H.M.S. Vivian, and in 1931 the first passenger liner, the Conte di Savoia, was successfully equipped. The system is that any rolling of the ship is detected by an auxiliary gyro, which causes the main gyro to counteract the torque caused by the sea. On the Conte di Savoia there were three stabilizing gyros, each driven by a 560-hp squirrel cage induction motor; it took an hour to bring the 110-ton gyro rotor up to its effective (normal) operating speed and an hour and a half to reach the maximum speed of 910 r.p.m. A.c. motors were provided with axial ventilation through the stator and rotor punchings, which were designed for the most efficient transfer of heat; ball and roller bearings were assembled in cartridge type housings, and small air gaps, stiff shafts, and former-wound coils fitted in half-open slots were employed. From this basic design came a new form of totally enclosed fan-cooled motor—the double air circuit type—flameproof motors, and many other adaptations. By 1932 motors had been designed and made for the higher voltages up to 6,600, and two years later an economical design was available for the smaller sizes down to 20 hp 3000 V and 200 hp 6600 V. The double air circuit design was a great advance; at once the old maximum rating of about 75 hp for totally enclosed motors was far exceeded, and it is now used for motors up to 1,000 hp. D.c. motors had the novel features of double-ended ventilation, ball and roller bearings with cartridge type housings, and metal spools for the field coils (helping to cut out hot spots). A new design was made for crane service and was later adapted for flameproof enclosure. For industrial use, d.c. totally enclosed machines were produced with radiators mounted above and below the motor. The new designs of standard motors were quickly followed by developments in steelworks motors (including live roller motors), synchronous induction motors with overhung exciters, flameproof conveyor and coal-cutter motors, flameproof motors for the oil industry (including large totally enclosed fan-cooled machines), steel frame motors for gold mining work, and large motors for boiler feed pumps. Control gear developments kept pace with the growing complication of industrial processes, and an increasing number of special equipments embodying all sorts of automatic features were designed and manufactured. Examples are 1,000-hp and 2,000-hp Ward-Leonard control equipments supplied for push benches at a Corby tube works, large d.c. contactor boards supplied to an Ebbw Vale steelworks (including Ward-Leonard equipment for an 800-hp skin pass mill and a 7,000-hp blooming mill), automatic control gear for compressors, coke oven equipment, and multi-motor contactor boards for coal preparation plants such as that for the Comrie colliery, the most up-to-date in the country. By 1930 control gear for the vital auxiliaries in power stations was being provided with latched-in contactors to ensure continuity of operation. Liquid controllers were developed in 1933 for controlling 1,500-hp and 2,000-hp winders and were the largest that had been built by the Company. They catered for reverse current braking and included an automatic acceleration device. The development of gate-end boxes, one of which received an early 'Buxton certificate' (August 19, 1932) from the Mines Department testing station, came to a head in 1937 with the MU 81, now a household word in mining circles. Equipments for coal cutting, conveying, drilling, lighting and section feeders completed the range for service below ground. Flameproof haulage control gear, including a cam-contactor controller, was introduced in 1936. In 1937 the Company introduced a system of 'unified boiler control' for use in power houses. In this a d.c. supply to the armatures of the boiler auxiliary motors is varied by means of a single rheostat, thus controlling the motor speeds. As the boiler is operated with its dampers wide open the gas system resistance is a minimum, and the least possible power is taken by the auxiliaries. Moreover the motor fields are provided with tertiary windings arranged so that ideal combustion conditions are maintained over the whole range of boiler load. This most efficient and flexible of controls has so far been applied to seventy-five boilers, representing a total evaporation of 2500 tons of steam per hour and ranging from small industrial boilers to the largest high pressure boilers in operation in this country and overseas. Investigations into commutation, electrical and magnetic losses, ventilation, and mechanical problems produced traction motors of lighter and more efficient design. 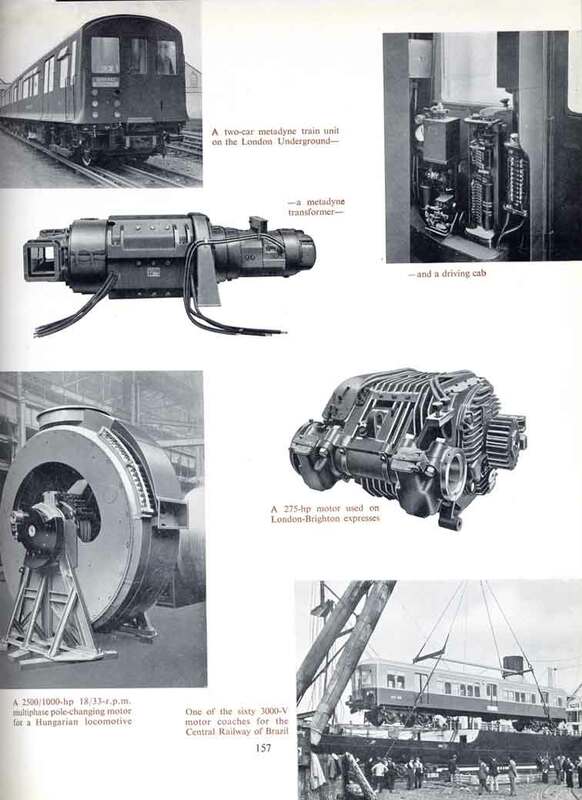 Traction gearing, transformer 'metadynes', auxiliary motor-generators, and generators for Diesel-electric locomotives became established products of the Sheffield works. The metadyne, in which the Company became interested in 1932, is one of a family of cross-field d.c. machines designed to utilize armature reaction. In the original dynamo invented in 1904 by Rosenberg, who became the Company's chief electrical engineer, the cross field was obtained by short-circuiting an additional set of brushes, but it could also have been produced by connecting them to an external supply. This was the method employed by J. M. Pestarini, later Professor at the Institute Electrotechnico Nazionale Galileo Ferraris at Turin, in his transformer metadyne. As applied to electric traction, the metadyne changes the constant voltage supply from the line into a variable voltage supply for the traction motors, giving a continuously variable transformation ratio and keeping the output current constant. It thus takes the place of resistances for limiting the starting current, and it also permits the train to be stopped by regenerative braking. Over a hundred metadyne equipments were put into service on London Transport trains between 1938 and 1940, and they are still in successful operation. During the war, the metadyne was further developed as a power amplifier. An unusual method of a.c. traction — the Kando system — was adopted by the Hungarian State Railways in 1931. The Company received an order for motors and control gear for twenty-six locomotives, which were to be equipped with 2500-hp three-phase motors fed through phase converters from a 16,000-V single phase supply. The M-V equipment was transported on English railway trucks all the way from Manchester to Budapest, 1300 miles in ten days. Trolleybus electrical equipment was first investigated round about 1930, and designs for lightweight trolleybus motors were developed. Within a year or two the trolleybus showed signs of becoming an effective competitor to the tramcar and the motorbus. The M-V motor had a single-turn armature winding and a low speed full field characteristic; the design concentrated on obtaining the best possible commutation and foreshadowed many features of the present-day motor. Robust forms of control equipment of the unit switch type were developed between 1933 and 1935, first electromagnetic and later electro-pneumatic, and systems of regenerative and rheostatic braking were worked out, the latter becoming the more popular, Other innovations had been made available: an m.g. set for low voltage lighting, having a single shaft but double insulation between motor and generator; provision for manoeuvring the vehicle on the lighting battery; and coasting and run-back brakes to prevent it from running away downhill, forwards or backwards. The first commercial venture came in 1933 when sixteen sets of equipment were supplied to the South Lancashire Transport. Then London Transport decided to replace all the trams north of the Thames with trolleybuses, and in 1934 the Company was asked to design electrical equipment for the prototype three-axle vehicle, Today the London Transport Executive operates a fleet of 1780 trolleybuses with 1400 motors and 900 control equipments of M-V design or manufacture. The success of the initial equipments caused trolleybuses to be adopted by other towns, and the use of M-V trolleybus equipment increased rapidly. 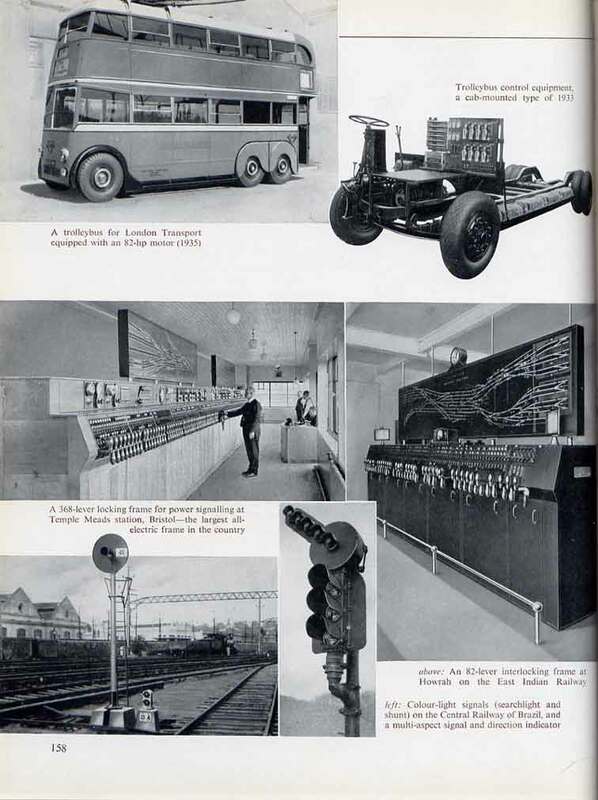 By 1936 the Company had become the leading supplier to British undertakings and was making about 40 per cent of all trolleybus electrical equipment manufactured in this country, a position it still holds. Electric welding equipment, both arc and resistance, made rapid progress. About 1930 the growing popularity of bare wire electrodes brought up the question of arc stability, particularly on the lower current range, and in the following year 200-A and 300-A welding sets were developed, giving a much steeper volt/ampere characteristic. This was obtained by using a diverter resistance connected across the series field winding, fine adjustments being provided by shunt control. In 1931 also there was introduced a single-operator a.c. arc welder consisting of an air cooled transformer to step down the supply voltage to 85-V and a tapped choke coil, built into the transformer, to give about 25-V at the welding arc at all currents. In 1933 further investigations into arc stability led to the development of new generators having still better dynamic characteristics, and two years later the Paradyne single-operator welding set was introduced; this design had no exciter, therefore being lighter and requiring less maintenance, and the field poles and windings had been redesigned to improve the welding characteristics. A new type of a.c. arc welding equipment was brought out in 1937—the Thermae single-operator welding transformer; this was an air cooled unit in which infinite variation of the welding current was obtained by adjusting the transformer core. Automatic arc welding was tackled from about 1929. The machines developed were installed first in the Company's tank shop for welding large switch tanks and a year or two later in other works for boilers, torque tubes and pipes. Equipment for atomic hydrogen welding was also developed, and by 1933 both hand welding apparatus and an automatic set for transformer radiator tubes were in use in the works. In 1937 an automatic equipment was made for welding Bren gun magazines; further sets were sent to Canada. Welding electrodes were made from 1932, braided electrodes being produced at a rate of about 30 feet a minute. Five years later the use of the extrusion process enabled the speed of production to be stepped up to a maximum of 300 ft a minute. Resistance welding machines were also developed, starting in 1935 with a 300-kVA spot welder for aluminium and aluminium alloys in the aircraft industry. This machine, the first of its kind in the country, was designed to give the high currents and extremely short welding times required; it was provided with fully synchronous control. Aircraft spot welders were developed in the next year or two in 390 and 650 kVA sizes, and also a smaller 350-kVA machine provided with high voltage thyratron control. High frequency generators for supplying the coils of induction furnaces were made first in the salient pole type for 500 c/s and later in the inductor type for 1,000 c/s and over. 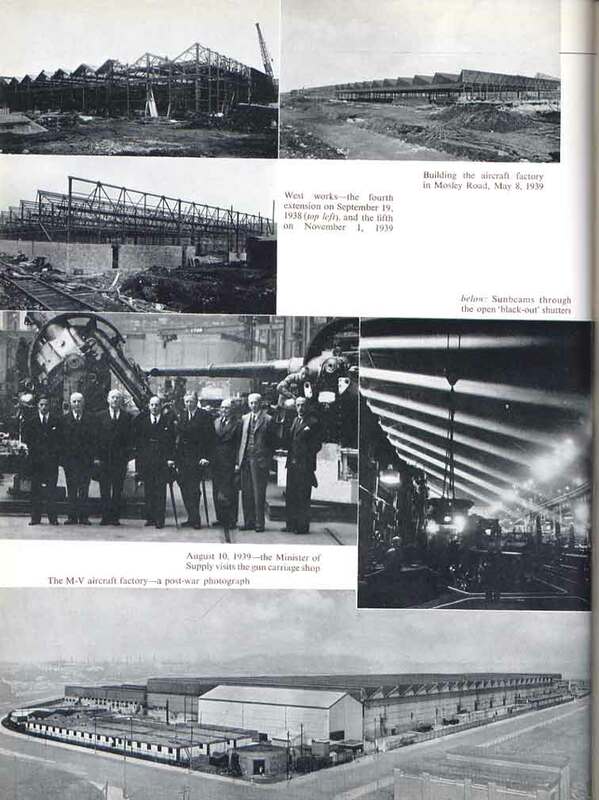 A 1,500-kW equipment built in 1936 for a Sheffield steelworks was the largest in England and one of the largest in the world. It will however be surpassed by a 2,050-kW set now being installed with four three-ton furnaces at another works in Sheffield. When the manufacture of other cooking and heating equipment left Trafford Park, that of tubular-sheathed elements was retained, and in 1931 a 'radiant' type of boiling plate was developed. In this a tubular-sheathed element in grid form was fixed above a reflector and designed to run at a red heat, thus avoiding the slow heating of the solid cast iron plate and the necessity for good contact between plate and saucepan or kettle. The first of these boiling plates were sold in 1932 and at once attracted attention, partly by their psychological appeal to housewives who like something glowing. Within two years the department had outgrown its accommodation and was laid out for mass production in G aisle. The Sunvic vacuum switch, contained in a glass envelope, was introduced in 1932 for the control of electrically heated ovens, furnaces and so on. Originally invented and produced in Germany, the switch was developed in the Company's instrument and meter department with the result that its use expanded considerably. This led to the production (for Sunvic Controls) of apparatus for the domestic field, notably the Simmerstat for the gradual control of electric boiling plates and thermostats for controlling water heaters, domestic ovens, heating pads, and so on. A. P. M. Fleming, C.B.E. Sir W. Lingard A. Goulding, Bt. This page was last edited on 7 February 2019, at 17:53.